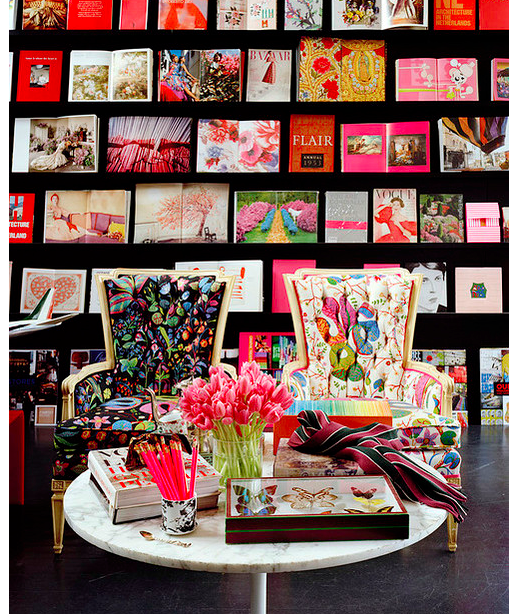 Mix and Chic: Absolutely gorgeous and chic mom cave inspirations! Absolutely gorgeous and chic mom cave inspirations! We have all heard about man caves but what exactly is a mom cave? Mom cave is defined as a spare room or a designated area in the home that is transformed into a personal space where a woman can re-energize through the activities she loves. A perfect mom cave consists of a place for you to sit, a space to organize your stuff, an area to do the things you love and room for your girlfriends to visit. Below are some beautiful inspirational spaces that can be easily converted into a gorgeous, ideal and relaxing mom cave. A room with a combination of two gorgeous antique French chairs with modern, colorful artistic print upholstery, classic marble top coffee table, fresh pink tulips, framed butterfly collection and small pretty accessories and several black book shelves with casual reading materials is the perfect area for any woman to read her latest fashion magazines and design books or simply to unwind after a long day in style. 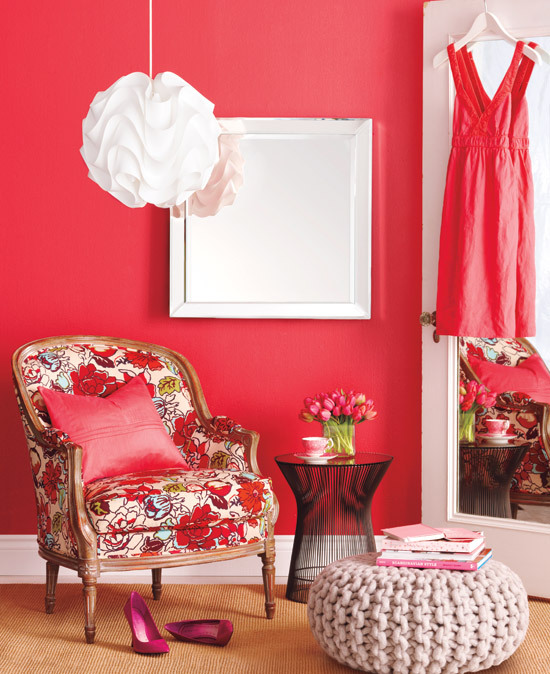 A mixture of an antique French chair with flowery motifs upholstery, beige knitted pouffe, sculptural Platner side table, sculptural Le Klint pendant light, square beveled mirror, sisal rug, fresh red tulips in a bright red room creates a chic and feminine area perfect for reading and relaxing. A marriage of a sleek chaise lounge, gilded table, mirrored chest, crystal table lamp, gold tone vintage chandelier, pleated drapery, a few silk decorative pillows and a pink wall of panels create a gorgeous, elegant and stylish boudoir ideal for lounging, relaxing or reading. 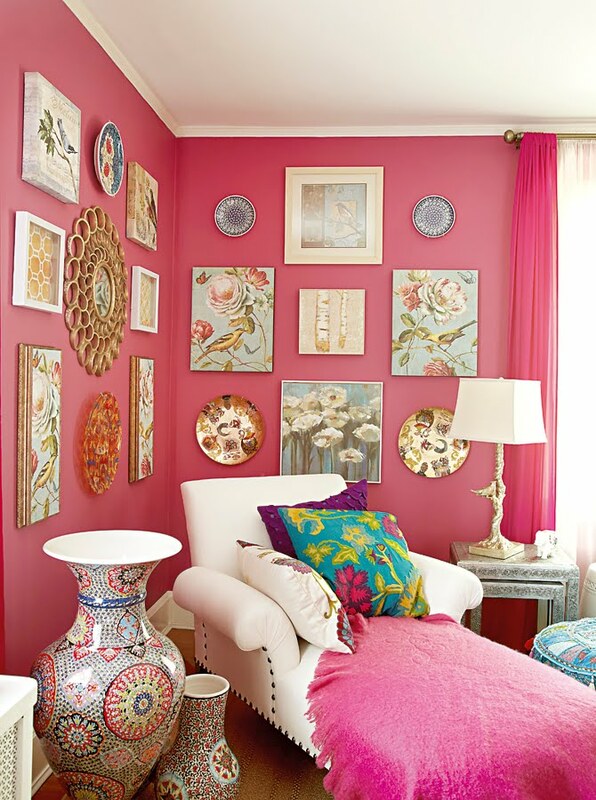 A white casual upholstered daybed with pleated rolled arms and nail head details, huge vases, a few colorful decorative pillows, a pink throw, a branch table lamp, two piece nesting table, pink walls decked with arts and plates in different styles and sizes with coordinating pink curtains exudes charm, style and casual elegance ideal for reading and relaxation.